Segment Four of the Colorado Trail takes you throught the Lost Creek Wilderness. Lost Creek Wilderness has many miles of excellent trails that are very accesible in winter. On this particular day we only saw one other car at the trailhead and did not see a single person all day. 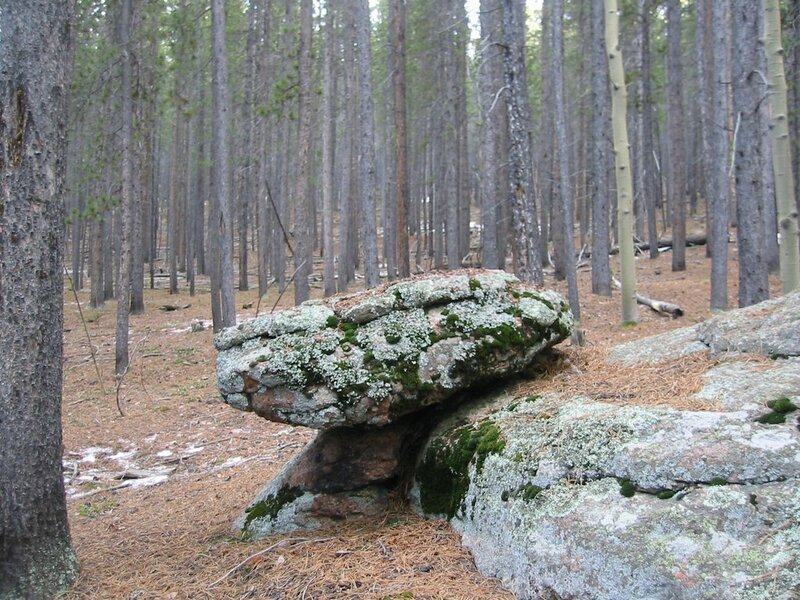 If you like seclusion close to Denver, this might be your place. Nick and I started at the east trailhead on FS 560 and planned on an out and back 17 mile hike. The first mile takes you through a nice meadow that looks to be prime game country and there are signs of tree stands here. The second mile follows an old road and takes you to the wilderness boundary at about 1.8 miles in. You gradually climb on this old road which follows a ridge. 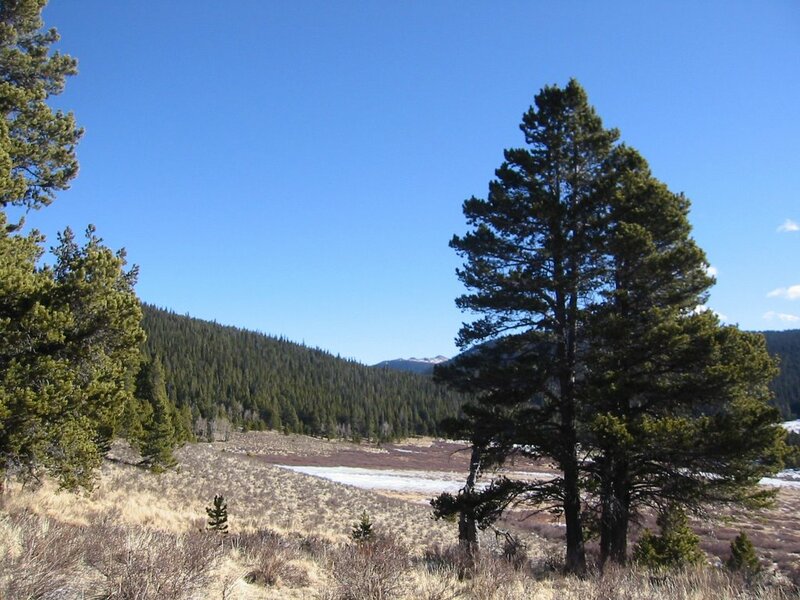 The ridge does not provide many good views due to the dense forest of pines. At mile 2.3 you pass through a patch of quakies that surround a stream. Just over three miles in you will see the Payne Creek Trail junction. The first six miles is a gradual incline that gains over 2,200 feet in elevation. 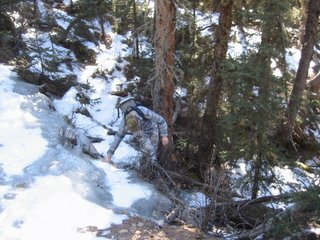 At mile 4.5 we encountered more incredibly cool frozen streams. That's right the stream is completely frozen as shown in the pictures to the left. At mile 5.4 the Colorado Trail leaves the old road built by Hooper. Hooper's road hit some marshes just passed here that caused him t o exceed his budget. On Nick and my last attempt at this trail we also hit the marshes, stopped had lunch and made the return trip. The trail was very snowy that March in 2004, but today is much less so. Trail maintenance has improved and it is hard to miss the detour now. For the next two miles the trail is narrower and windier as it climbs to the crest and then starts the descent into Lost Park. 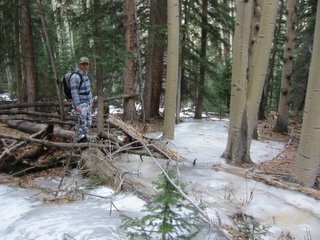 Through here we encountered the coolest of the frozen streams. At mile 7.4 you return to the old road and it finally d rops you into Lost Park at mile 8.5. 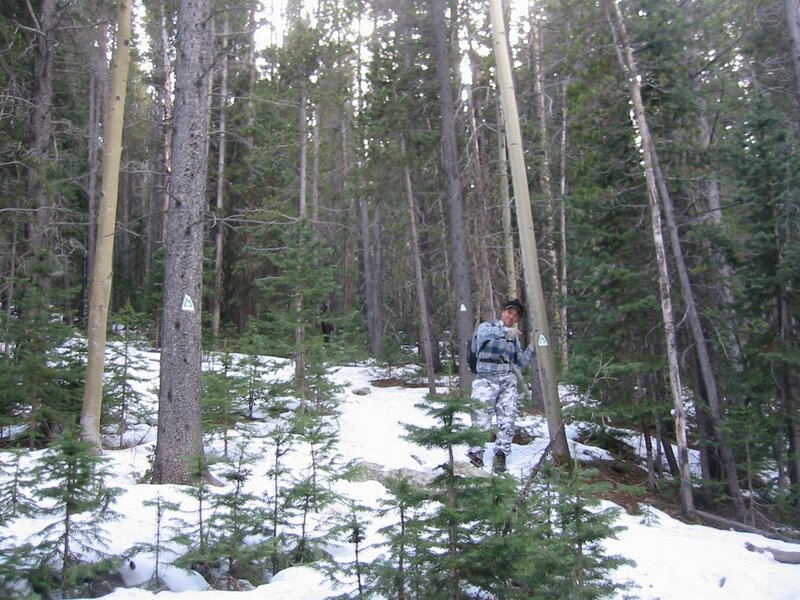 Here is the other Wilderness boundary and the spot where Nick and I stopped for lunch. After all of the wooded trail the open views here are a nice reward. Please check out www.augtrail.com for more information on this segment. The return trip seemed a lot longer... isn't it always so?